Based in the Cockcroft Building on the University of Brighton’s Moulsecoomb campus, the School of Environment and Technology has an established track record of pioneering research in the subject areas of built environment, civil engineering, environmental sciences, geoarchaeology, geology and geography. We have invested heavily in our research facilities and have a team of highly motivated academic staff, many of whom are leaders in their fields. We have a strong interdisciplinary ethos, working across our subject areas to contribute to positive developments in both local and global communities. The school’s academics are key to the research and enterprise Centre for Aquatic Environments, and the school also hosts six research and enterprise groups (REGs): the Applied Geosciences REG, Built Environment REG, Environment and Public Health REG, Past Human and Environment Dynamics REG, Society, Space, and Environment REG, and the Sustainability and Resilience Engineering REG. 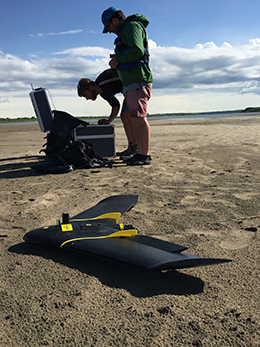 Image credit: School of Environment and Technology Research Officers Rob Strick and Chris Simpson using a fixed wing drone to map the dynamics and bed morphology of the South Saskatchewan River, Canada.